MINNEAPOLIS & REHOVOT, Israel--(BUSINESS WIRE)-- Stratasys Ltd. (Nasdaq:SSYS), the 3D printing and additive manufacturing solutions company, took a significant step into low-volume, continuous production using additive technology today when it unveiled a new product under development - the Stratasys Continuous Build 3D Demonstrator - at the RAPID + TCT Show in Pittsburg. Commercial product availability has not yet been announced. The new platform is composed of a modular unit with multiple 3D print cells working simultaneously and driven by a central, cloud-based architecture. To set new standards in additive manufacturing throughput, the Stratasys Continuous Build 3D Demonstrator is designed to produce parts in a continuous stream with only minor operator intervention, automatically ejecting completed parts and commencing new ones. 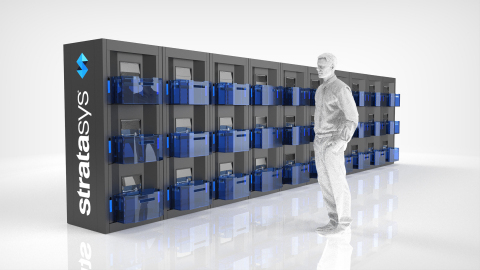 Each 3D print cell can produce a different job to help enable mass customization projects. Additional cells can be added at any time to the scalable platform to increase production capacity as demand requires. Automatic queue management, load balancing and architecture redundancy further lead to accelerated throughput as jobs are automatically routed to available print cells. If a single print cell fails, the job will be automatically rerouted to the next available cell. Target applications include education RP labs and environments that can benefit from zero tooling production and from a zero inventory supply chain. "The Stratasys Continuous Build 3D Demonstrator is an important milestone in the company's long term vision to make additive manufacturing a viable solution for volume production environments," says Scott Crump, Stratasys Co-founder and Chief Innovation Officer. "It combines our FDM print quality, GrabCAD control and monitoring, and a new multi-cell, scalable architecture to create a breakthrough manufacturing platform." Savannah College of Art and Design (SCAD), a preeminent art and design university, ensures all students have 24/7 access to state of the art 3D printing services. Installing a Stratasys Continuous Build 3D Demonstrator in the award-winning university's Design Lab expands student learning opportunities in 3D printing, and the enhanced technological capacities benefit professors and students focused on advanced design projects and skills. "This is the future!" said SCAD president and founder Paula Wallace. "We believe the Stratasys Continuous Build 3D Demonstrator represents the next generation of 3D printing, the first-ever platform of its kind. The world has never seen an approach to rapid prototyping like this before. As ever, SCAD students are the earliest adopters of design technology." In'Tech Industries, Inc., a premiere supplier of rapid prototyping/additive manufacturing, engineering services, tooling services and injection molding, wanted to expand its 3D printing offerings to create a bridge-to-production solution for their OEM customers. The automated workflow of the Stratasys Continuous Build 3D Demonstrator enabled In'Tech to offer same-day or next-day delivery of quantities of identical or mixed parts that would eventually be injection molded, helping the company dramatically improve customer service without adding additional staff. FATHOM, an advanced manufacturer with an expertise in additive technologies, is leveraging the Continuous Build 3D Demonstrator to push the limits of additive manufacturing. Many of its customers have adopted digital fabrication beyond prototyping as a means of production and are using proven additive technologies like FDM for high-value, end-use applications. Having a six-cell configuration in-house at FATHOM increases throughput significantly and enables a greater volume of FDM parts within a shorter lead-time. With the Continuous Build 3D Demonstrator, there is an opportunity to use FDM more effectively for not just a hundred just-in-time parts, but for 1,000+ parts on-demand. Stratasys introduced the Continuous Build 3D Demonstrator as a technology demonstration today at the annual RAPID + TCT Show at the Pittsburgh convention center and will showcase the system throughout the conference at booth 1513. Stratasys and FDM are registered trademarks, and the Stratasys signet and Continuous Build 3D Demonstrator are trademarks of Stratasys Ltd. and or its subsidiaries or affiliates. All other trademarks belong to their respective owners. The statements in this press release relating to Stratasys' beliefs regarding the benefits customers will receive from the Continuous Build 3D Demonstrator product are forward-looking statements reflecting management's current expectations and beliefs. These forward-looking statements are based on current information that is, by its nature, subject to rapid and even abrupt change. Due to risks and uncertainties associated with Stratasys' business, actual results could differ materially from those projected or implied by these forward-looking statements. These risks and uncertainties include, but are not limited to: the risk that customers will not receive the benefits of the Demonstrator outlined in this press release; the risk that technical difficulties will delay the shipping of the Demonstrator related to the forward-looking statements; and other risk factors set forth under the caption "Risk Factors" in Stratasys' most recent Annual Report on Form 20-F, filed with the Securities and Exchange Commission (SEC) on March 9, 2017. Stratasys is under no obligation (and expressly disclaims any obligation) to update or alter its forward-looking statements, whether as a result of new information, future events or otherwise, except as otherwise required by the rules and regulations of the SEC.